These six network feeds are the most basic function of what Thord created in terms of our ability to filter through relevant updates to our readers in any particular niche and obviously these can be subscribed to, e.g: for the new media network. And with some simple CSS hacking, we as a network are able to display boxes on our sites displaying the latest feeds from our other blogs in the same niche, such as one can see at 901am already. Thord‘s script also makes life much easier for us on the backend, with no need for mashing up with Yahoo! Pipes and the like, giving us the ability to choose which blogs and which posts at any given time should be displayed in a network feed on a site we choose. 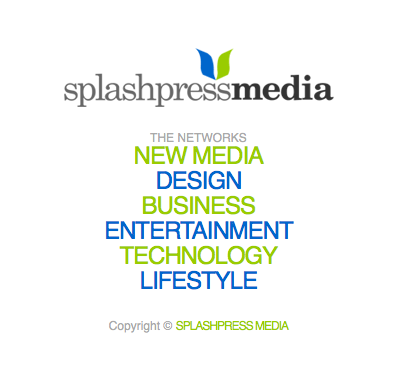 Do check out SplashpressMedia.com and subscribe to any network feed that interests you! You may also notice that we have added links to these network feeds in the sidebar of this site.